In this chapter, we study the inverse problem on recovering a spatial component of the source term in a wave equation by the final observation data. Employing the analytic Fredholm theory , we establish a generic well-posedness result concerning the uniqueness of our inverse source problem . Numerically, by treating a corresponding minimization problem, we investigate the variational equation for the minimizer and develop an iterative thresholding algorithm . One- and two-dimensional numerical experiments are implemented to demonstrate the robustness and accuracy of the proposed algorithm. 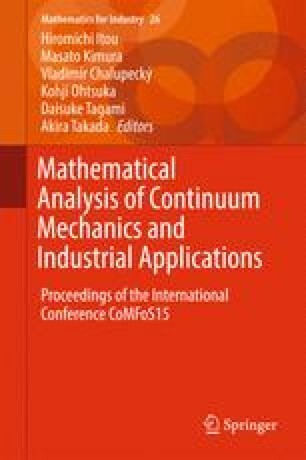 The work was supported by A3 Foresight Program “Modeling and Computation of Applied Inverse Problems,” Japan Society for the Promotion of Science (JSPS). The first author was financially supported by self-determined research funds of Central China Normal University from the colleges’ basic research and operation of MOE (No. CCNU14A05039), National Natural Science Foundation of China (Nos. 11326233, 11401241 and 11571265). The second and the third authors are partially supported by Grant-in-Aid for Scientific Research (S) 15H05740, JSPS.